The end of World War II (WWII) saw the beginning of the Cold War between the Soviet Union and the United States and its allies. By early 1950, the U.S. Navy realized that Soviet submarines, which were based on the best of German WWII technology, posed a grave threat to America’s security. Several secret technical meetings were held to discuss the Soviet submarine threat. Frederick Hunt, who was the head of Harvard University’s Underwater Sound Laboratory during WWII, argued that the U.S. Navy could use the SOFAR (for SOund Fixing and Ranging) channel to detect submarines at distances of hundreds of miles by listening for the noises that they generate. The SOFAR channel had been discovered toward the end of WWII, when scientists realized that a sound channel exists in the ocean that allows low-frequency sound to travel great distances. During WWII, the U.S. Navy experimented with the use of low-frequency, long-range transmissions as a lifesaving tool. The idea was that survivors of a downed aircraft or sinking ship could drop a small explosive charge set to explode in the ocean sound channel. The arrival times of the signal at a number of widely-spaced, on-shore listening stations could then be used to calculate the position of the life raft (See How is sound used to navigate underwater?). The project was called SOFAR, giving the SOFAR channel its name. The first SOSUS stations were sited from Barbados to Nova Scotia on a huge semi-circle looking out into the North Atlantic Ocean. Whitman, 2005. Under a cloak of great secrecy, late in 1950, the Office of Naval Research (ONR) funded the American Telephone and Telegraph Company (AT&T) and its manufacturing arm, Western Electric, to develop an undersea surveillance system designed to detect and track Soviet submarines using the SOFAR channel. The initial effort was code-named Project Jezebel. The system that resulted was given the then highly classified name SOund Surveillance System (SOSUS). Eventually it was given an unclassified designation, Project Caesar. In an extraordinary engineering effort, arrays of hydrophones were placed on the ocean bottom. The hydrophones were connected by underwater cables to processing centers located on shore called “Naval Facilities (NAVFACs).” The first prototype of a full-size SOSUS installation — a 1,000-foot-long horizontal line array of 40 hydrophones laid on the seafloor at a depth of 1440 feet — was deployed off the island of Eleuthera in the Bahamas during January 1952. After tests in which the array proved able to detect a U.S. submarine, the Navy decided to install similar arrays along the entire U.S. East Coast. Two years later the Navy decided to extend the system to the West Coast and Hawaii as well. These early SOSUS line arrays were located at the edge of the continental shelf looking out into the deep ocean. At the time, cable lengths were limited to less than 150 miles (241 kilometers), and the NAVFACs therefore had to be located at coastal sites where the shelf break came closest to land. In order to analyze the signals, AT&T adapted a device called a sound spectrogram, which had recently been invented to analyze speech sounds. The Low Frequency Analysis and Recording (LOFAR) instruments installed at the NAVFACs were designed to analyze low-frequency underwater sounds to show which frequencies were present. The distinctive sound signatures generated by submarines could then be seen in what were called LOFAR-grams. On the left, NAVFAC Centerville Beach, 225 miles north of San Francisco, California. On the right, the SOSUS watch floor at NAVFAC Centerville Beach. Each LOFAR “gram-writer” produced a frequency vs. time display of the sound arriving at the array from a specific direction. Whitman, 2005. The SOSUS system was very successful in detecting and tracking the noisy diesel and then nuclear Soviet submarines of the Cold War. The sailors operating the early SOSUS arrays also detected some sounds whose sources were at first unknown. One particular unknown sound was attributed to the “Jezebel Monster.” The sound was later found to be low-frequency blue and fin whale vocalizations. As increasing numbers of Soviet submarines began entering the North Atlantic from bases in the Barents and White Seas, additional NAVFACs were established in Iceland and Wales. 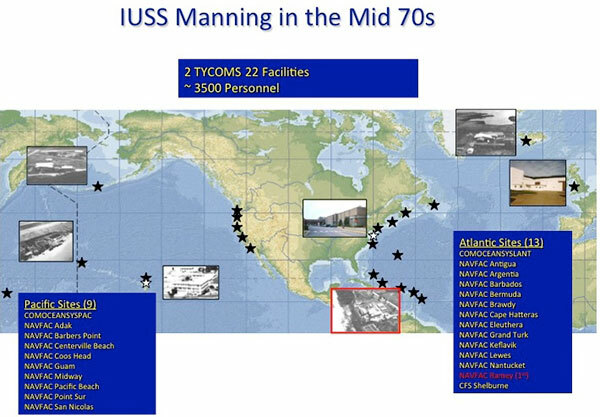 By the mid-1970s, the SOSUS system consisted of 20 NAVFACs, two Ocean Systems commands (COMOCEANSYSLANT and COMOCEANSYSPAC), and about 3,500 personnel. SOSUS in the mid-1970s. The black stars represent NAVFAC sites; the two white stars represent the Ocean System Commands. Image courtesy IUSS-CAESAR Alumni Association. (http://www.iusscaa.org/). In the 1980s, improved cable technology, closely related to the technology used in trans-oceanic telephone cables, also allowed the arrays to be located farther from the NAVFACs. All of the coastal Atlantic and Caribbean sites were replaced by Naval Ocean Processing Facility (NOPF) Dam Neck, for example. In addition, the network of fixed arrays was augmented by acoustic surveillance ships deploying the Surveillance Towed Array Sensor System (SURTASS), which was a towed line array over 8,000 feet long. The overall system, including both the fixed and towed arrays, was called the Integrated Undersea Surveillance System (IUSS). The system reached its Cold War peak with 11 NAVFACs/NOPFs, 14 SURTASS ships, two Ocean Systems commands, and manned by approximately 4,000 personnel in the late 1980s. IUSS in the late 1980s. The black stars represent NAVFAC or NOPF sites; the two white stars represent the Ocean System Commands. IUSS-CAESAR Alumni Association (http://www.iusscaa.org/). Eventually, Soviet intelligence learned of the existence of SOSUS and its remarkable success in tracking Soviet submarines at long ranges, with the help of information supplied by the Walker-Whitworth spy ring. John Walker was a U.S. Navy warrant officer and submarine communications expert who sold countless naval messages to the Soviets from 1968 to his arrest in 1985. Jerry Whitworth was another Navy communications specialist recruited by Walker to assist with his espionage activities. The Russian Navy responded by working to quiet their submarines. 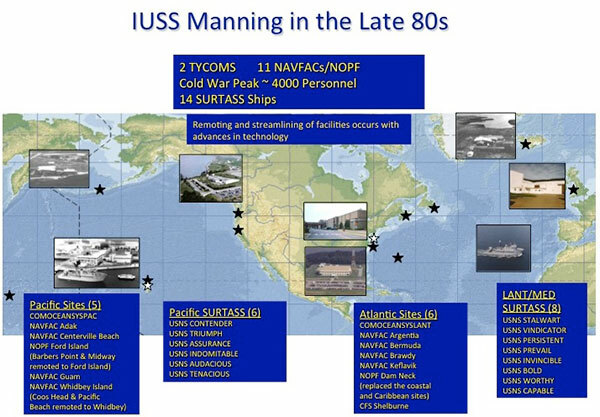 By the end of the Cold War in the late 1980’s, the ability of IUSS to detect and track Soviet nuclear submarines at long ranges had decreased significantly. Modern diesel-electric submarines are even quieter and more difficult to detect by passive listening. The combination of the end of the Cold War and improved technology resulted in a much smaller system. 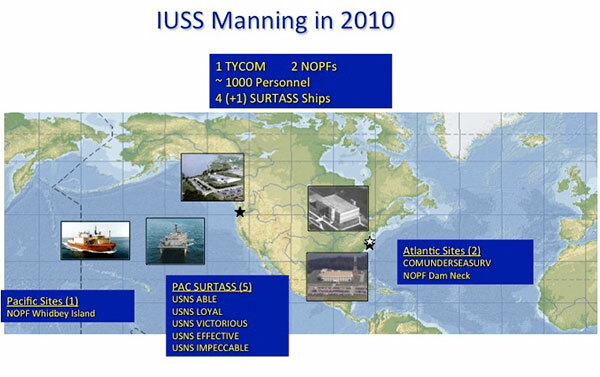 By 2010, only two NOPFs, five SURTASS ships (all in the Pacific Ocean), a single system command, and about 1,000 personnel remained. IUSS in 2010. The black stars represent NOPF sites; the one white star represents the Undersea Surveillance Command. IUSS-CAESAR Alumni Association (http://www.iusscaa.org/). Image courtesy IUSS-CAESAR Alumni Association (http://www.iusscaa.org/). Even during the Cold War, the U.S. Navy allowed a small number of oceanographers to make use of the SOSUS system for research. One of the earliest applications was to measure the speed and direction of deep ocean currents using floats. The floats were designed to drift with the current and transmit low-frequency acoustic signals at regular intervals. The acoustic signals were originally received on the SOSUS hydrophone arrays and the arrival times were used to compute the float positions. The floats were called SOFAR floats. With the end of the Cold War, the U.S. Navy permitted civilian scientists more access to the SOSUS system for basic research. The system has been used to study underwater volcanic eruptions and earthquakes since the early 1990’s. It has also been used to study marine mammals and their vocalizations. Finally, it has been used to measure large-scale ocean temperature variability by making precise measurements of the travel times between widely space sources and SOSUS receivers. How is sound used to study undersea earthquakes and volcanic eruptions?